Searching for Bonobo in Congo » African Grey Parrot Bust _ Now What? 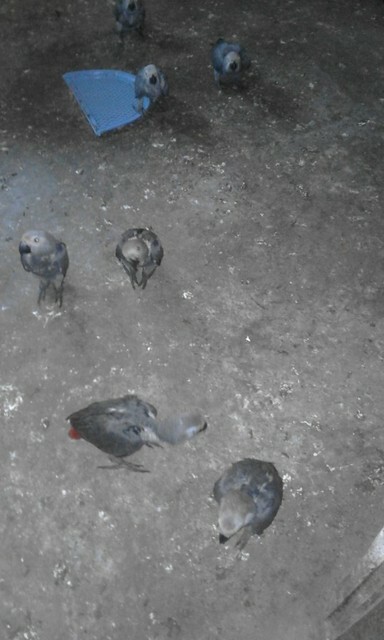 Recently dead African Grey Parrots are scattered through the periwinkle at a holding site of one of Byart Birds’s local buyers. Four motorbikes loaded with baskets of African Grey Parrot chicks crossed the Kasuku River for Kindu on February 14th just as it grew dark. The security officer on duty knew that they were illegal. He called Leon who has been documenting the grey parrot traffic through Kindu for more than a year. 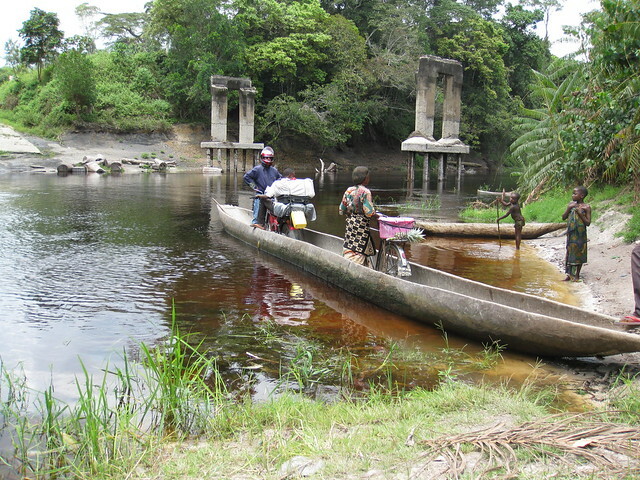 A dugout ferry takes motorbikes across the Kasuku River. The ancient bridge pillars in the background attest to colonial ambition – never realized. 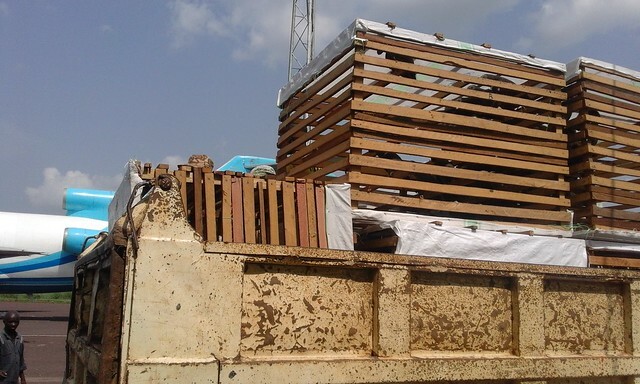 Leon informed Maniema’s Environment Minister; the minister sent security officers to intercept the shipment at Byart Birds’s holding facilities in Kindu. Theo and Cams, local buyers who hold the parrots before shipping to Kinshasa, were under immediate house arrest, and now in jail. A local buyer watches as his facility is taken over by security forces. He had been paying climbers with advance funds from Byart Birds. 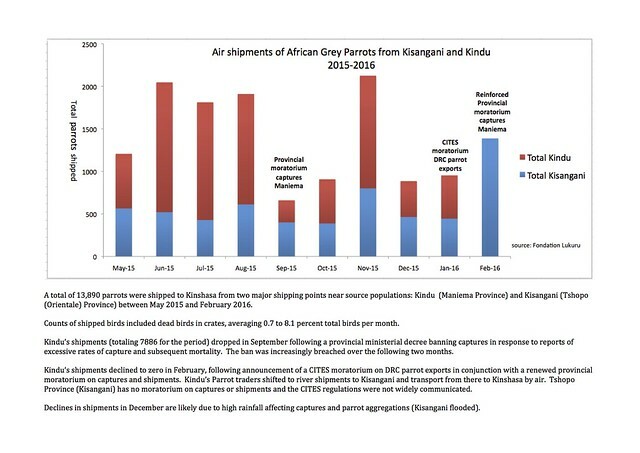 Up to now excesses in the African Grey Parrot trade hid behind the semi-legality provided by a CITES export quota for DR Congo. 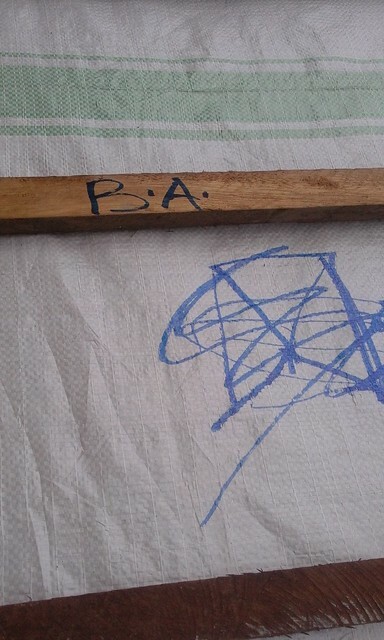 “Maison Byart” is scratched out below and replaced by the more discreet “B.A.”. Perhaps a recognition that the illegality of the operation was more than the usual. Not only were far more than the permitted 5000 exported annually, but also these were acquired at the expense of huge mortality at every stage of the capture and shipment process. At the end of January, the governor of Maniema announced that the parrot capture season would remain closed – no captures, no exports. There was no longer any ambiguity – these birds were illegal. 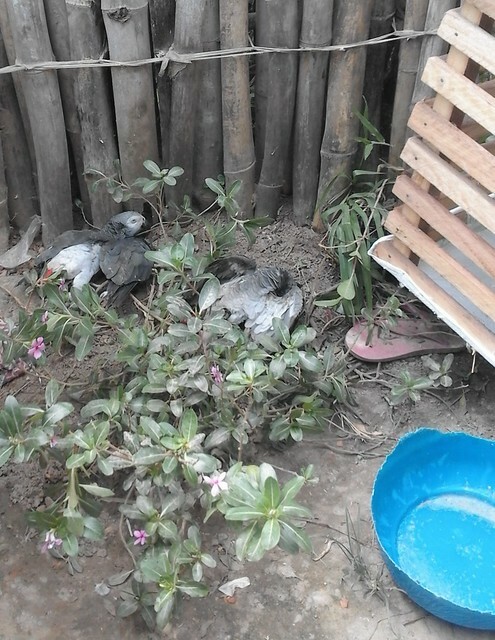 The authorities in the province of Maniema knew that in January 2016, CITES put a ban on all African Grey exports out of DR Congo except for 1600 supposedly ready for transport. 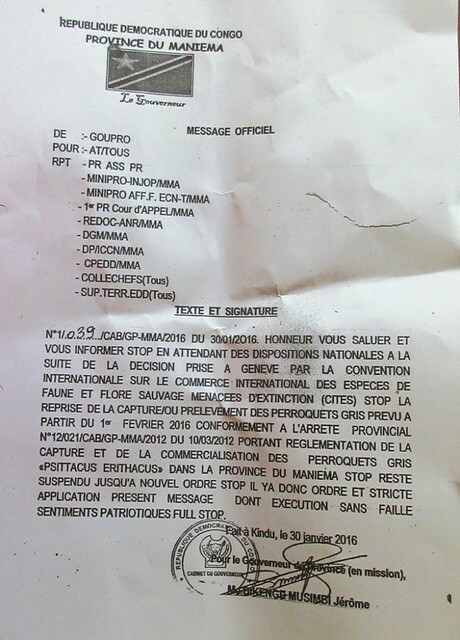 Maniema’s capture season for grey parrots was to reopen at the beginning of February. The governor passed a decision to keep it closed (see above). 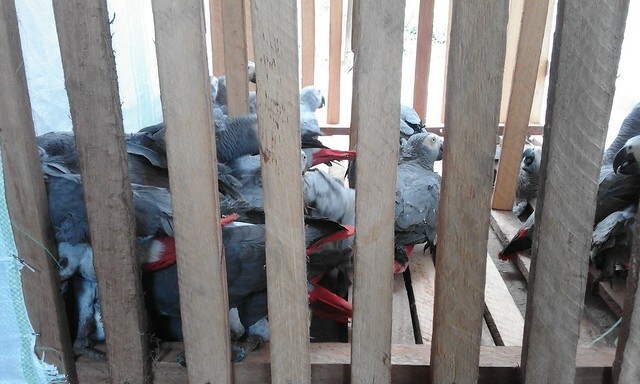 African Grey Parrots being held for Byart Birds at one of the raided facilities in Kindu. These were almost all taken before fledging from nests over the last three months. These birds were illegal in Maniema and they were certainly not part of any national stock ready for export. Captured as only partially feathered chicks over the last three months, they had to be hand fed a mush to even stay alive. 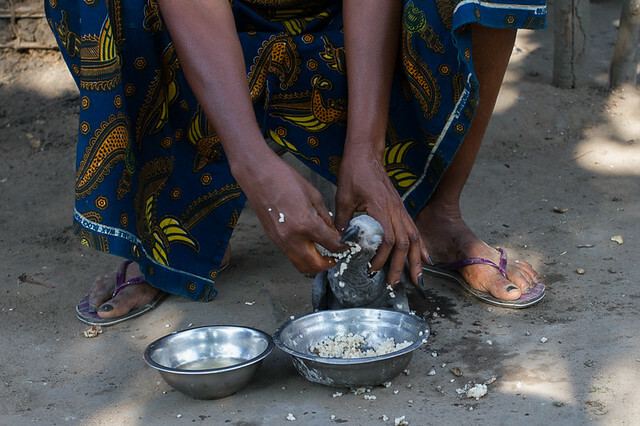 Force feeding a chick after capture at Lake Ndjale before sending to Kindu and eventually Kinshasa. The parrot trade in DR Congo has developed in a make-believe legality. Restrictions are side-stepped, re-interpreted and never literally applied. As unstoppable as an afternoon shadow, the disappearance of African Greys spreads over Congo’s forests. Already Provinces that were parrot redoubts a few years ago have lost their colonies and profitability. Collectors and commissioners move to neighboring forests. 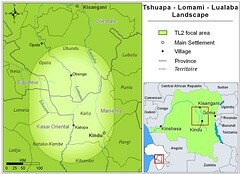 In the TL2 landscape (Maniema and Tshopo Provinces), the parrot commerce is run by people from Sankuru and Equator Provinces where the parrot forests are now nearly empty. These immigrant collectors climb to take parrots from roosts in Maniema where local villagers have no idea of the value. 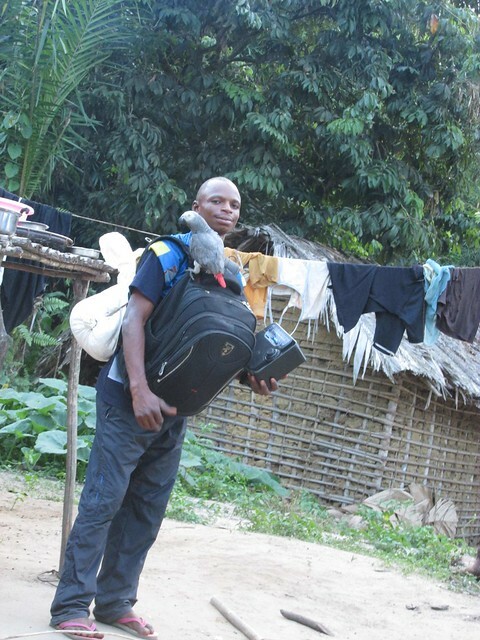 An itinerant parrot climber with decoy bird, boom box and other essential possessions. What is the value? An African Grey is sold in South Africa and the Middle East for 100s of dollars. The buyer in Kindu buys a parrot from the climber for $5 or $6. Dead parrots on the trash pile at a local buyer’s holding facility. When the Province closed Byart Birds’s holding facilities, they contained at least 420 living parrots. 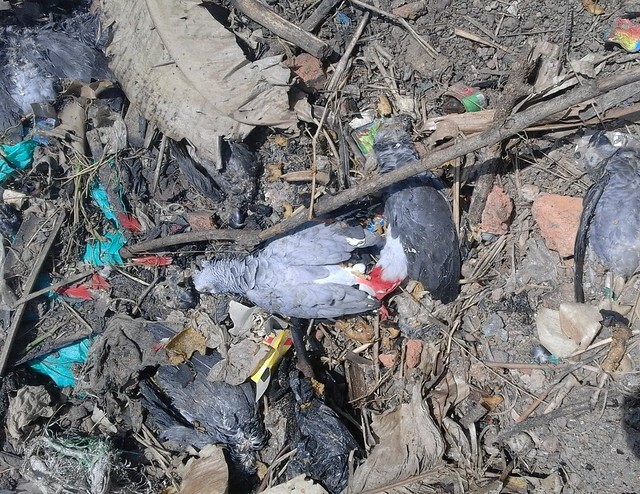 In the four days after they were busted, at least 65 parrots died. All of these parrots appear to have been taken as nestlings. Some of the youngest birds at the facility. An attempt to release the birds was made. Only fifteen could fly. In Theo’s facility there was a 10 year-old teacher bird that trains the nestlings to eat their peanuts, but most were not able to respond to the possibility of flight. 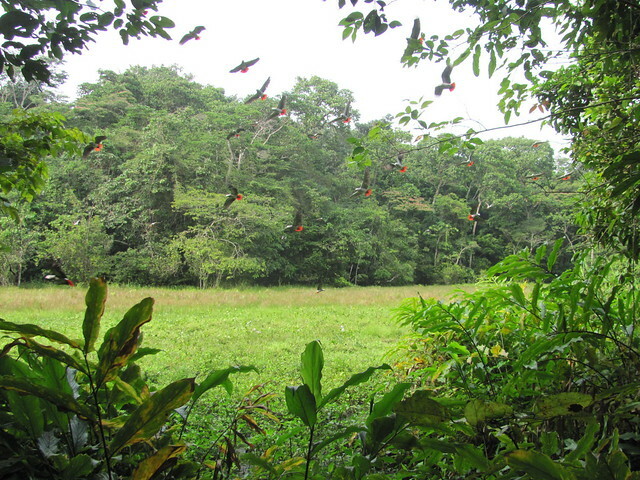 It is estimated that all had been taken from nests in the last few months, all during Maniema’s closed season. The ICCN provincial director and head warden of Lomami National Park overseas the crating for shipment to Kinshasa of the illegal birds. The parrots in one of the crates. The crates at the airport. Two hundred and ninety five (295) living birds were transferred to ICCN (Congolese Conservation Institute) and flown to Kinshasa. 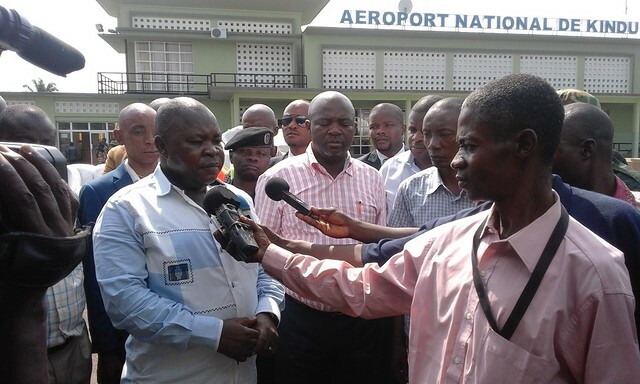 The governor, Tutu Salumu Pascal, came to the airport for the shipment and made a public warning of the illegality of all parrot captures and trade in the Province of Maniema. Because the Maniema authorities were monitoring air shipments, parrots started going downstream on Congo River barges instead. 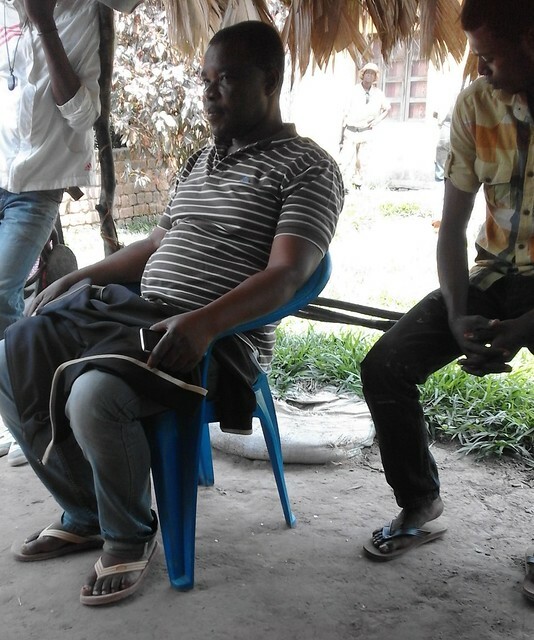 They would then be flown out of Kisangani where it was still semi-legal. Leon was informed by one shipper that his load of 130 parrots left the dock in Kindu, but only 30 were alive on arrival in Kisangani. 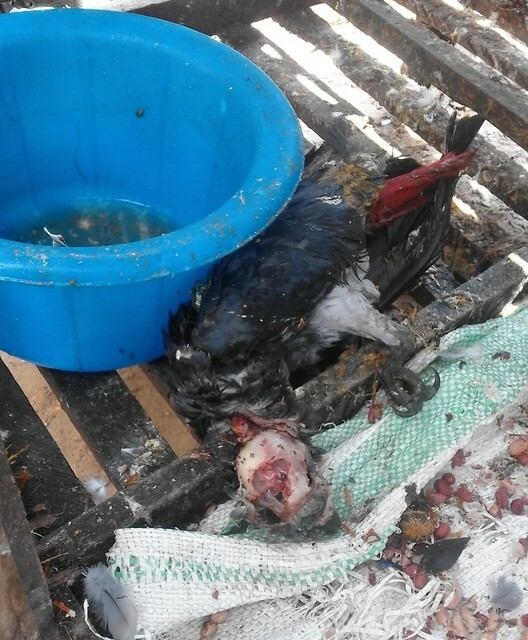 Dead parrots in the parrot food at one raided facility in Kindu. Another shipment of confiscated parrots is now being prepared for Kinshasa as the authorities in Kindu uncover more illegal parrots. A load of 54 parrots of the “group Byart” was arrested on the river. Only 39 of these survived. 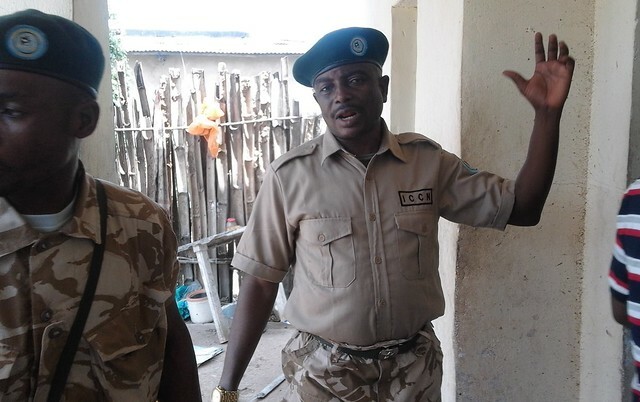 Of a group of 72 handed over in Kindu, 11 survived. Another small group of parrots (5) was arrested from collectors on the road to Kindu. At this reporting, one is dead. Red tail feathers glowing in the sun….as it should be. Despite the high mortality, what is happening now is the best news for parrots yet in DR Congo. The semi-legality with all its false permits, cheating on numbers and seasons, and multiple names for single exporters is being revealed. It has to be stopped. 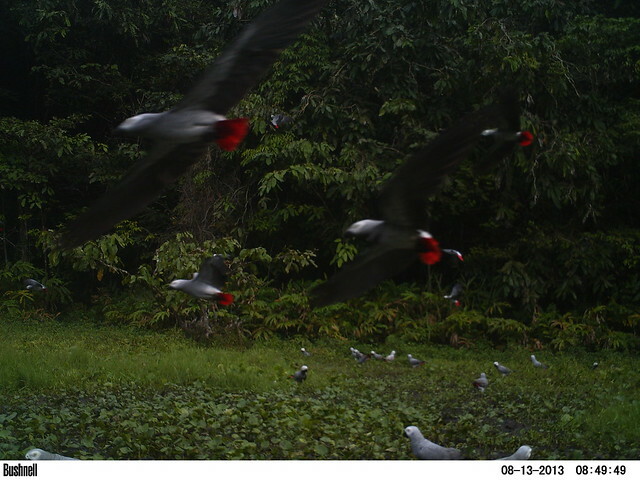 On wing before a camera trap … as it should be. Our hope is that the cynical disrespect for international norms revealed by this “bust” will be taken as seriously nationally and internationally as is the case in the province of Maniema, itself, where a moratorium of at least two years on all parrot captures is being prepared. The buyers are being arrested and climbers chased from collection sites. A Congolese forest where evening comes on without the reassurance of a parrot chorale, raucous and friendly, will be followed by a dark and very long night. This entry was written by Terese Hart, posted on 2016-03-10 at 6:30 am, filed under Kindu, Law and Order. Bookmark the permalink. Follow any comments here with the RSS feed for this post. Trackbacks are closed, but you can post a comment. Thank you for your work and for sharing this deadly information. Too many people are unaware of this and simply go and buy a parrot as a pet, not knowing that these animals are not fit for that and also not knowing about the large scale of illegal and criminal trade. I hope your work helps to stop the trade. After retirement I wish I could do some work for this project. This barbarism has got to stop. I hope that the African grey can come on the Cites list as A classified. That will give the authorities more power to work. As an owner of a tame bred African grey this just breaks my heart. Yes they are wonderful animals but you NEVER take them from the wild. They should never have to be subjected to this kind of treatment. Save the Grey. They do not know it but they are destroying of the worlds smartest parrot and soon there will be no more. Anyone can go the Marche De Voleur in Kinshasa and buy one. It is not even being hidden. They also sell other illegal animal and forest products.